Happy New Year! And happy Australia Day to all my fellow Aussies! Hard to believe we are already at the end of January. Christmas seems like a distant memory, school starts tomorrow and we have our first Secret Recipe Club post for 2015! I am so excited for another year of SRC. For those who are new, each month we are assigned a blog in secret to peruse, choose a recipe from and post on the same day. Today is the reveal day for Group D.
This month I was assigned Baking and Creating with Avril. Avril describes her food as 'nothing too fancy but always made with love and happiness'. I love this! I headed straight to the kid-friendly section and found so many recipes that my kids would love like the Blueberry Pie Pancakes, Cookie Sticks and Yummy Zucchini Cookies and I've bookmarked them to try. I'm always on the lookout for dinner ideas though and was really tempted by Avril's Risotto and Beef Stuffed Tomatoes but when I saw a recipe called (Carrie's Famous) Tater Tots Shepherd's Pie I just had to check it out. I mean who is Carrie and why is it famous? I also had no idea what tater tots were and quickly learned they are the same as potato gems here in Australia! In her post Avril describes how her friend Carrie made this casserole while they were away for a week's holiday as a part of a group of 9 girlfriends and their 7 children. How awesome would that have been? I am definitely raising the idea of a girls' week away with my friends! The classic shepherd's pie has mashed potato on top but strangely none of my kids are that keen on mashed potato, whereas I could eat it by the bowlful. They do however, absolutely adore potato gems/tater tots and we do get them as a treat every now and then. So how could we go wrong with a shepherd's pie topped with potato gems! I couldn't resist making one change to the recipe and that was to add something tomato-y to the meat. I used a tin of condensed tomato soup and loved the flavour but it did make the bottoms of the potato gems a little mushier than how they appeared to be in the original recipe. No matter, it was delicious! 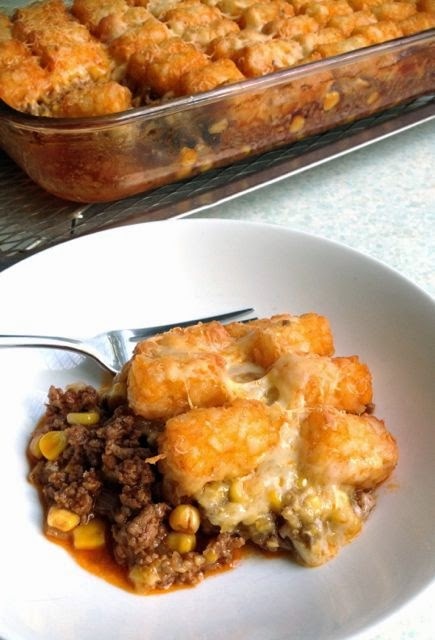 Rich savoury mince with corn, cheese and crunchy topped potato gems. Just divine and a perfect kids meal. Over medium heat, saute chopped onion in a little oil until soft. Add in the beef mince and cook until well browned, then turn off the heat and drain any extra grease. Stir in the tomato soup, garlic salt, pepper and Worcestershire sauce. Pour the meat mixture into a 9 x13 baking dish, then spoon over the creamed corn and drained can of sweet corn. Sprinkle a layer of grated cheese over corn, layer frozen tater tots over grated cheese and then sprinkle with more cheese to finish. Bake for 25-30 minutes (check after 20 minutes to make sure casserole is not getting too brown). Thanks for a brilliant recipe Avril (and Carrie). We all loved it! Potato gems!! Haha! What a fun little name! And this looks like the perfect use for them... so delish! This is wonderful! Tater Tots are a secret love of mine =). Happy New Year to you! Looks delicious! Thanks for sharing with the SRC. This is such a clever idea. We love shepherd's pie in our house, and it's usually made on a Monday night out of the leftovers of Sunday night roast lamb. We don't have tater tots in New Zealand either, and I'm not sure about potato gems, but I'm sure we have something similar. I love tater tots. Very rarely have them though. This is making my stomach growl. This looks so good, way better than the mashed potato version of Shepard's pie. My husband and I would eat this right up. Happy Reveal Day! I don't have any kids at home but I might pretend and make this delicious looking dinner anyways!! Yum! I may have to make that and freeze it for when I go to the hospital for labor & delivery. Happy reveal day! Brilliant recipe! 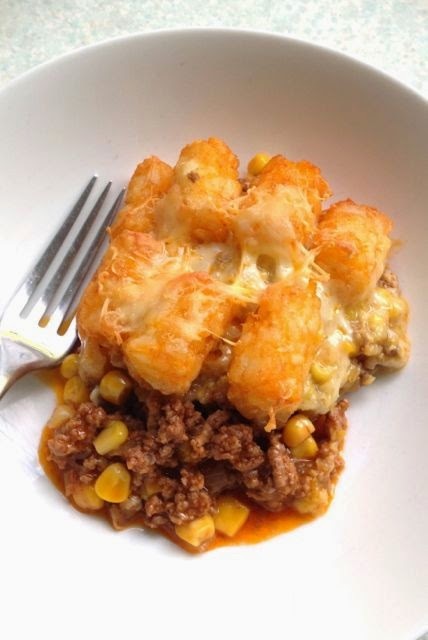 I love the idea of tater tots on a shepherd's pie! Great pick this month!! a casserole covered with them... WOW! I don't think I could get away making this since my husband & I live alone, but it sounds incredibly tasty! I love my tots~ Think this would freeze well? This looks really good! I think I need to pick up a bag of tater tots!! My favorite breakfast dish is Buttermilk Pancakes. 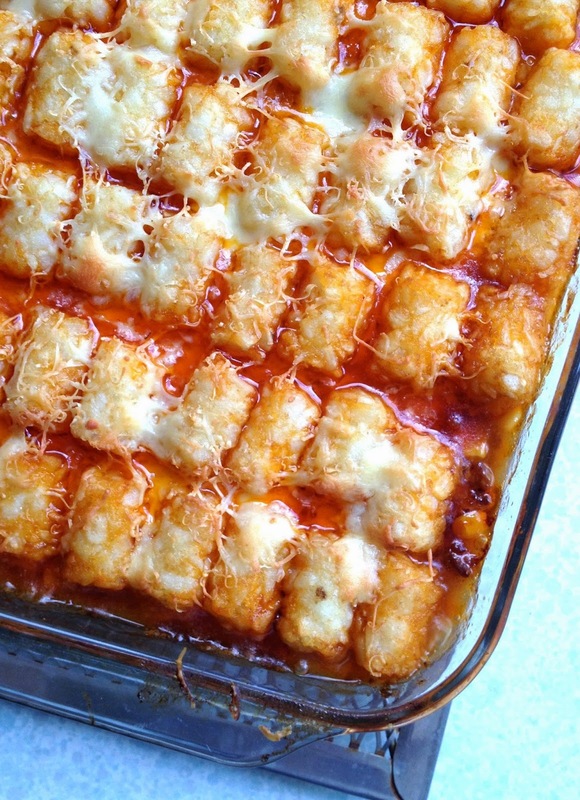 This tater tot pie would be a great weekend breakfast meal.